We are Eric Dempsey and Hazel Johnston, a husband and wife team. As Birds Ireland, our aim is to share Ireland’s rich diversity of birds and nature through our guided tours, writing, public and corporate speaking and photography. We’d also be delighted to welcome you to our peaceful bird and nature-friendly home, set in a wild wooded garden in the gentle hills and coastline of Wicklow. 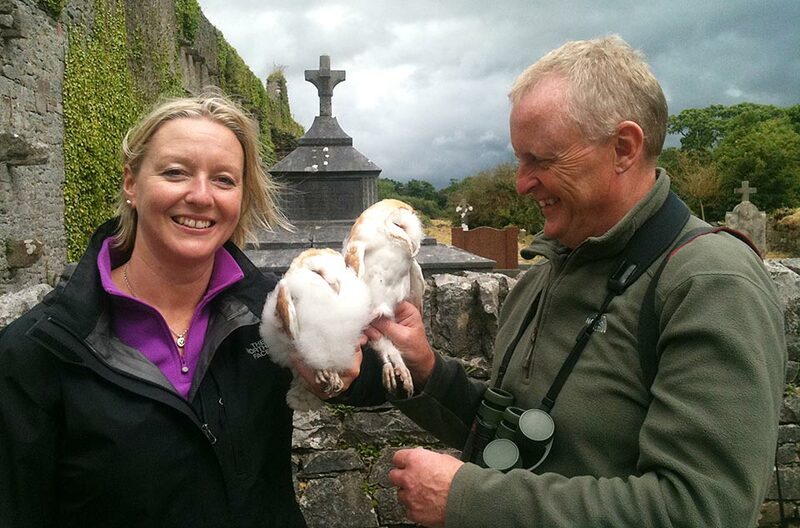 Eric is Ireland’s leading bird expert and the author of eight books on Ireland’s birds and wildlife. Hazel has worked for many years in the hospitality industry and is enjoying bringing her experience to welcoming guests to our home. Together, we will provide a relaxed, fun and nature-filled experience to remember whether you are on a birding trip with Eric, attending one of his talks or simply relaxing in our loft apartment. With over 40 years experience of observing the natural world, Eric is a much sought after public speaker throughout the country. He hosts public talks and workshops nationwide and is a listed ‘Heritage Expert’ working with the Heritage Council. He also leads Irish and inter­national eco-tourism groups to all parts of Ireland in search of birds. Eric has made numerous TV appearances and is a team member of the popular 'Mooney Goes Wild' on RTE Radio 1. With a lifelong interest in the natural world, Eric’s main aim is to bring an awareness and instil a love for Ireland’s bird life and natural heritage through his speaking, writing, guiding, broadcasting and photography. Eric has also developed a whole new thinking on what business and life lessons we can learn from birds; sentient beings that have successfully conquered every known location on the planet and which undertake extraordinary life journeys. Now acknowledged as Ireland’s leading expert, Eric is author of many books including ‘The Complete Field Guide to Ireland's Birds’, ‘Birdwatching in Ireland with Eric Dempsey’ and ‘Finding Birds in Ireland’. He is also the co-author, lead photographer and general editor of ‘Ireland’s Wildlife Year’. His new book, ‘Don’t Die in Autumn – a memoir’ has just been published to critical acclaim. Born and raised in Finglas in north Dublin, Eric Dempsey now lives with his wife Hazel in Newcastle, Co. Wicklow. Having lived in Australia, the Middle East, France, Switzerland and the UK, Hazel has gained and embraced a very global view of hospitality. Coupled with her warm, bubbly personality Hazel will ensure that, should you choose to stay with us, your time with us will be a relaxed, enjoyable and comfortable one. Hazel shares a love of nature, birds and all things wild and, having spent so many years away, appreciates and enjoys life in Wicklow where she was born. She is also a support to Eric on large birding tours and is always there to share the wonderful birdlife found at the Lodge. Together, Eric and Hazel will ensure an experience to remember.